Every so often, I'm gifted a few bottles of the good stuff from up-start breweries that are making their way in the world. Sometimes they're news to me, sometimes they're an evolution, a new branch on the craft beer family tree, that I've been tracking for some time. Perennial out of St. Louis is one of the latter. 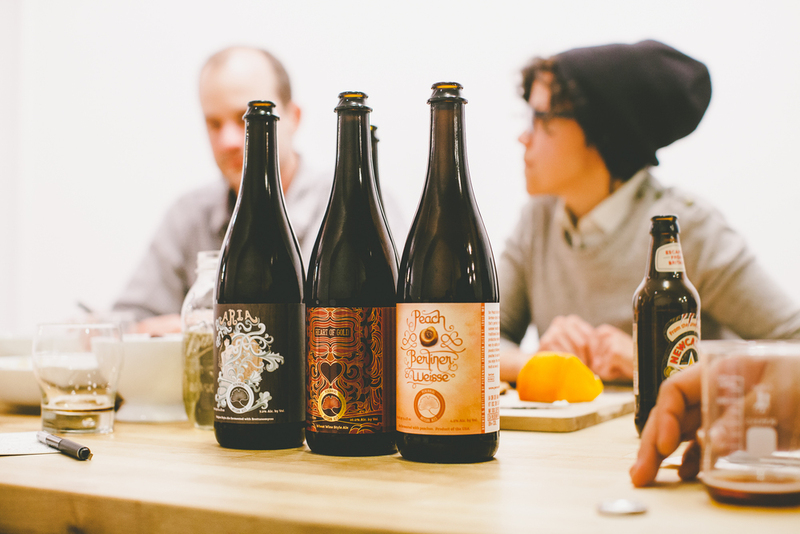 Founded by a former Goose Island and Half Acre brewer, Phil Wymore, Perennial Artisanal Ales has crept confidently into beer geek circles for their Belgian-style beers with delicate flavors and ingredients, backed by some well-hopped aromas. So when three bottles of Perennial showed up at my door, I decided to spread the wealth and host a small blind tasting. I invited a couple of experts, as well as casual drinkers who'd never heard of the brand, or tasted their wares, to get some wide-open reactions to what was in the bottle. I truly believe that a diversified group is the best way to keep a vocabulary fresh, and dodge consensus that can so easily happen form beer experts. No one knew what we were drinking, but pretty quickly, we all knew it was great. Quite tart and acidic, with a light body, and a ton of citrus on the nose. A lot of esters and phenols popping off, a little musty. Mouthfeel is like a club soda and lemonhead sharpness, a slightly sour zing, almost like a yogurt, and softens quickly. Super crisp. Juicy peach flavors linger, light on the malts, really pure finish. This was an astonishing beer. Like an effervescent barleywine, lighter in body, beautiful amber color, but still with a good deal of viscosity. Caramel, hard candy, tawny port, dark fruit, vanilla, and leather all creep out of this as it warms up. A good amount of bitterness underneath keeps if from sitting too heavy. A little boozy in the finish, but still less than a traditional barleywine (the closest approximation of the style when blind). A lovely, relaxing beer for the fall/winter months. Immediate brett on the nose and palette, but otherwise almost oderless. Plenty dry with an orange pithiness in the bitterness. Thin in mouthfeel. A light, root-like and caramel sweetness but dissipates quickly. Finishes slightly bitter, hints of clove, but mostly just a dry brett lingering. A lot of carbonation akin to bottle conditioning. A bit one-dimensional, mostly seems to be featuring the brett yeast in a straight-forward way. Overall, these beers lived up to the hype, and then-some, for Perennial being a delicate, balanced, and adventurous brewer. The juicy flavor in the Peach Berliner Weiss was unstoppable. And Heart of Gold's boozy, rich, layered qualities made it perhaps the most unusual beer many of us have had in awhile. We each initialed the cellar/sharing tag, strung it around its neck, and called it a night. Off Color Brewing bottled their first six packs that night, and Paul was coming straight from the bottling line to the tasting. And like I've said before, if you're gonna come late, you better come heavy. Well done Paul. Troublesome forever. Love that shiny little mouse.